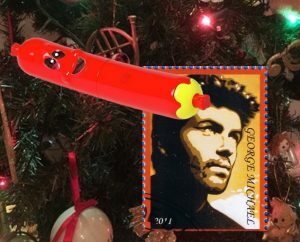 I wasn’t planning to write about George Michael – we’ve all read so much about him since his tragic passing on Christmas Day that’s it’s reaching saturation point, especially on Facebook. But it’s true to say that he was a major influence in my formative years and, being the third of my late-teen musical heroes to be snatched away during 2016, I decided to jot this down (even if it’s only Gill and Martine who read it). It made me so sad, but I smiled thinking about dancing to the Wham Rap 12″ in Gill’s bedroom. (Half my readers won’t know what that means!) We dressed like Shirley and Dee C Lee, with floaty rah-rah skirts and distressed leather boots. Dee’s sister went to my college – I think her name was Diane, and Dee came in to sing one afternoon. Not with George, unfortunately, but it was fun all the same. My Twitter profile says, ‘Doing everything, regretting nothing,’ yet we always regretted that we hadn’t gone along to the filming of Wake me up before you go-go. We had the fluorescent tops and glowing beads, the big hair and the wide smiles… Gill even had an authentic Choose Life t-shirt. The fashion and Wham!’s music absolutely typified our late teens. We did go to quite a few concerts though. I dated a roadie one year who got us tickets for consecutive nights. I didn’t particularly like him – I think his identical twin had the better personality, but the benefits were good… It was during that tour that we first saw George sing Careless Whisper. He sat alone on the stage on a solitary stool, and I remember thinking that those beautiful lyrics might be my favourite ever. As it’s turned out they’re not – but they’re probably somewhere in the top 20. Band Aid played on the TV on Christmas Day while we were busy with the Silly Sausage that had looked so good when Kylie poked it on Jonathan Ross last week. I was pointing out to the boys how our 80s pop idols are, today, either timeless megastars or no longer with us. I pointed excitedly at George, with his floppy blond highlighted locks, unaware that he’d drifted into the second category as we pulled and twisted the silly plastic toy. Then, of course, the obligatory Last Christmas came on. They played a clip of it later, after the news broke, and it made me cry. It’s been a far less cheerful ending to Christmas than usual, what with George passing, and various family members missing the holidays due to flu. But next week is a new year, and the start of wonderful things for everyone who believes that wonderful things can happen if you believe hard enough. Enjoy the rest of your Christmas week! 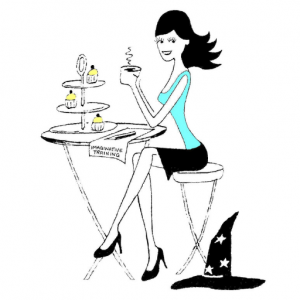 I’m working today, then not… but you can still catch me here if you need anything social media-related: @WeekendWitch.